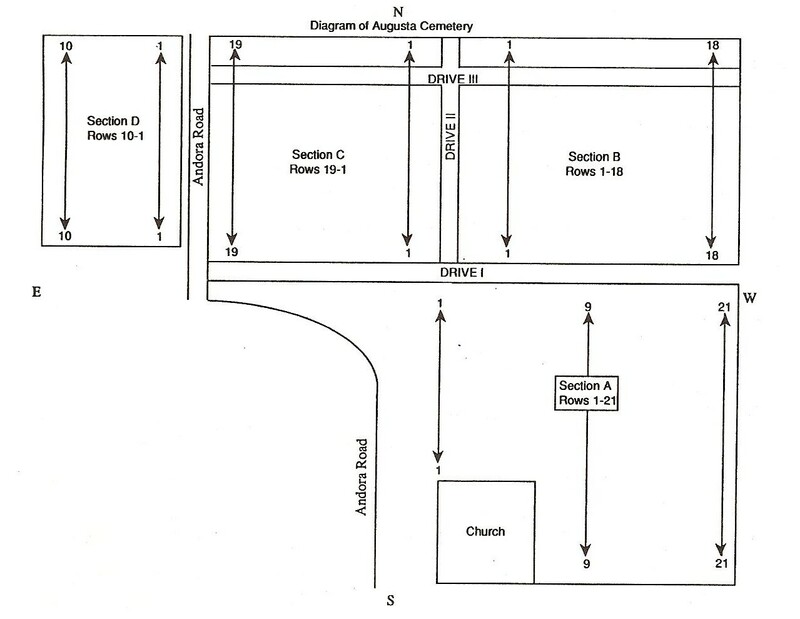 This diagram of the Augusta Cemetery comes from the book, "Carroll County Ohio Cemeteries, 1802-1990, Volume 1," which was produced by the Carroll County Genealogical Society. Below this diagram are more details on how the cemetery was mapped by the Carroll County Genealogical Society. Three driveways divide the cemetery into sections. Section A lies south of Driveway I which extends east and west. It is next to the church and is the oldest part of the cemetery. Section B is on the north side of Driveway I and extends across Driveway III to the north side of the cemetery. It is bounded on the west by Driveway II which runs north and south. Section C is west of the north-south driveway and extends to Andora Road (CR-10). It also extends across Driveway III to the north side of the cemetery. Section D is directly across Andora Road from Section C. All rows run north and south and were read from north to south. In Section A rows 1 to 21 begin at the north east corner of the section. In Section B rows 1 to 18 begin at the north west corner. In Section D rows 1 to 10 begin at the north east corner. Section A was read in June 1985 by Linda Gernert Houyouse. Sections B, C and D were read in September 1989 by Fred Long. Burials since those dates were added in 1990.